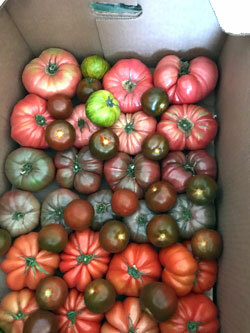 Chef favourites like heirloom tomatoes available to order through VFM Direct. 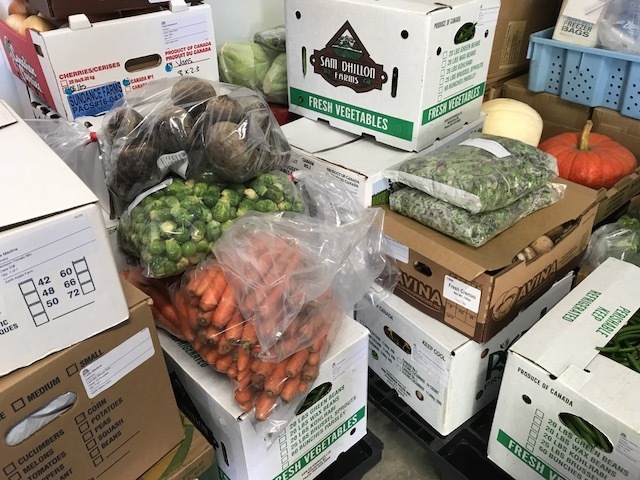 Vancouver Farmers Markets Direct is an aggregation and distribution service to connect farmers with restaurants, food service, retail and institutions. Founded in 2015 with FarmFolk City Folk as Vancouver Local Food Hub, VFM Direct aims to strengthen the local food sector by providing infrastructure to help local growers access the Metro Vancouver wholesale market. VFM Direct offers an online ordering platform for buyers to purchase local food for their businesses. Buyers know who grew their food and can learn more about the farmers through the website and through farm visits and “meet & greets” facilitated by VFM Direct. Farmers are able to sell their food directly to the buyers through our platform and they can receive a fair price for their goods – something not always part of the wholesale system. By aggregating multiple small farmers, VFM Direct can supply larger institutions and food service establishments, something previously not attainable if a farmer were working alone. 2018 Producers: BC Garlic Growers, Bredenhof Hops Farm, Cedar Isle Farm, Daily Fresh Produce, Earth Apple Farm, Flavourful Farms, Forager’s Delight, Glen Valley Artichoke Farm, Glorious Organics, Harvey’s Orchards, Jane’s Honey Bees, Klippers Organics, Maan Farms, Mandair Farms, North Pacific Kelp, Nutrigreens, Ohana Organic Farming Society, Pristine Foods, Prokam Enterprises, Sunberry Farms, Sweet Earth Farms, Taves Family Farm, The Food Pedalers, Tsawwassen First Nation Farm School, Your Wildest Foods. Visit our Producer Bio page for more information. VFM Direct is continuing to operate through the fall and winter, with deliveries twice a week. Are you interested in finding out more – signup for our Fresh Sheet, register on our website at direct.eatlocal.org and view the available products available now. We are will be launching our Summer Fresh Box program starting in June and are expanding to Saturday deliveries starting in April. Send us an email if you’re interested in receiving more information. We gratefully acknowledge startup funding for this service provided by the Vancity. INTERESTED IN REGISTERING WITH VFM DIRECT? VFM Direct makes accessing local food easier for restaurants, food service and retailers. We offer a convenient sales portal for local producers and we deliver the goods throughout the Metro Vancouver region. Farmers (organic and conventional) and wild harvesters who grow/harvest what you’d like to sell. All products must come from BC’s land or waters. We try to accommodate all BC producers who are describe themselves as small-medium sized but sometimes there will be more product of a certain type than we can hope to sell. In those cases, we would put you on a wait-list for those products but potentially still invite you to participate with other products that were not overlapping. WHAT DO I NEED TO BEGIN SELLING? All producers must review our producer handbook and sign and abide by our producer agreement. You will also need to submit proof of insurance and any certifications you’ll be claiming (organic, GAP) along with photos of you and your farm along with information for a producer profile. A site visit may also be necessary before sales can begin. – You will be required to transport your product to the VFM Direct hub on each receiving day – which means picking and packing and transporting by an agreed upon time (usually late afternoon). – Consider carefully how you will manage your available product. Between market sales and other sales channels, what you list on VFM Direct must be available for delivery, otherwise we will have many disappointed customers! – Think about your pricing carefully. VFM Direct will be taking on the tasks of marketing, delivery and invoicing – all things that you would normally build into your pricing structure. The VFM Direct Production Co-ordinator will work with you if you wish. HOW SOON CAN I ORDER? After registering on VFM Direct online, you’re welcome to place an order anytime. The first order will be secured by credit card. Future orders can be paid on a net 30 basis. Delivery days are regularly Tuesdays and Thursdays. Any special requests regarding delivery times can be included in the order notes when placing your order. We will call to confirm all deliveries for first-time clients. During the winter, deliveries may be reduced to once per week. We deliver anywhere from Abbotsford to North Vancouver currently. New clients are always welcome in any part of the Metro Vancouver region. WHAT IF I CAN’T MEET THE MINIMUM ORDER? The minimum order for VFM Direct is $150.00 per delivery but if you can’t get an order together for that amount, a delivery fee of $10 (for deliveries within Metro Vancouver) will apply.